A Bird Hunter's Thoughts: Having some fun in the off season! NSTRA. Having some fun in the off season! NSTRA. Back then, I walked fast and grumbled because I couldn't get a decent workout in during the day. I was known to change into running shorts and take off for an hour run between braces. Now, I grumble when I run more than 4 braces in one day, because my legs cramp and I'm sore all night! Back then, I worried my dogs wouldn't back. Now, I worry because they back too much. Back then, I thought a bird dog was a bird dog and it was all about the training. Now, I know genetics are paramount, but it's still a lot about the training. Back then, a trophy was incredibly important. Now, how my dog performs is incredibly important, way more than any trophy. Fast forward to today: We (Ruby) managed to win the 2016 Georgia Region NSTRA Championships. 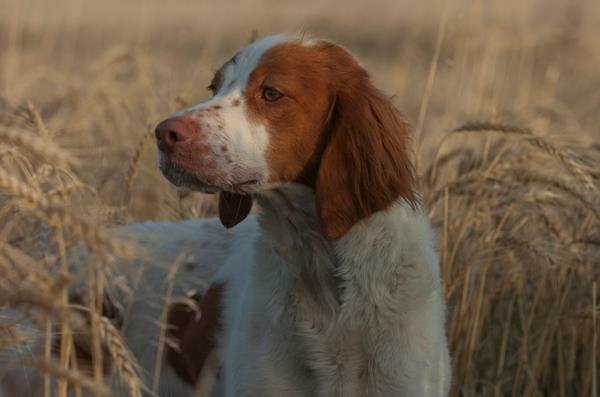 She is the first Brittany to have ever won the Georgia Region. 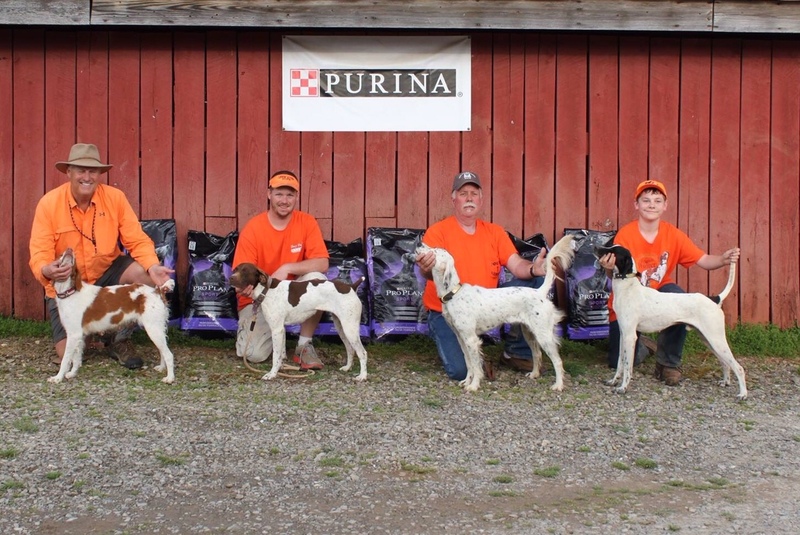 Over the years, we managed, with different dogs, to place Second twice, Third twice, Fifth once and Sixth once. I made a comment at the end of this trial that I felt like I was always the Bridesmaid and never the Bride! Well, all that ended last weekend. My dog, Ruby (NSTRA CH Flyboy's Ruby Deux), won the Region Championship! 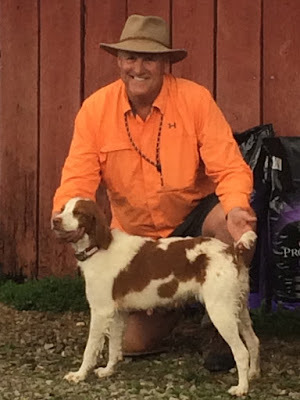 I qualified three dogs for the championship trial, Cap (my go-to male Brittany), Shack (my young, up-and-comer male Brit) and Ruby (my female Brit, who just had a litter 28 Dec!). I almost didn't enter her, since her puppies had only been gone a month and I wasn't sure she would be fit enough for 6+ runs in three days. Apparently, I was wrong. Not only did she have the fitness (we did work hard on that), but she had a tremendous desire! She missed one hunting trip with her puppies and a few field trials. Do you think she didn't know where I was and what I was doing without her? I'm lucky she didn't bite me when I got back and brought three tired and skinny bird dogs home. From the first run Friday, until the last retrieve on Sunday, she ran a hard and thoughtful race. I swear I saw her return to an area (at least twice, I saw this) and work it until she found and pointed a bird that was buried up in tall fescue! She's always been a thinker- and that will slow down a dog. Many times, the hard charging, run to the front dog will find more birds, while the thoughtful, methodical dog will be left behind in the race. This weekend, Ruby managed to use her head and her speed to her advantage. In addition, when I needed her to listen to me, she did. We were truly a team. Region President Gene Pritchett, me and my wonderful wife, BJ. So, now, the lady is retired. She has nothing to prove to anyone. She has her NSTRA Championship and her Region Championship and it's time for her to retire and make room for our follow-on male ball-of-fire, Shack. She will be my quiet, no drama, steady hunting dog and she will make my next puppy for the string. I never need to wonder when I drop the tailgate in Montana, Arizona, New Mexico, North Dakota, or anywhere, what dog I have when she jumps to the ground. I have my steady, reliable champion. My girl.